Muskoka is the most well known cottage country and resort area in Ontario and it's only 90 minutes by car from Toronto. Thirty minutes farther down the road you enter North Muskoka also known as the the gateway to Algonquin Park. 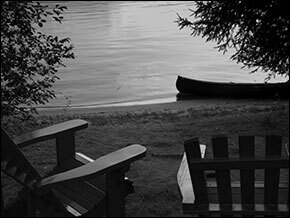 Covering 2,500 square miles, Muskoka is filled with rugged natural beauty. You'll find towering pines, picturesque waterfalls and sparkling lakes and rivers. There is an almost endless choice of recreational activities, diverse culture and all presented to you with a style of service that is both genuine and friendly. Almost all of the resorts have long histories, in some cases ones that span more than a century. But whether a resort has been in the same family for three or four generations or has newer owners who honour its storied past, one thing is certain: you'll find a warm, family-friendly atmosphere at an affordable price. Read more about how to create your own family traditions in North Muskoka. 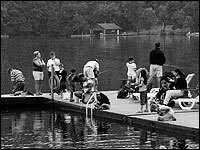 In 2004 a small group of resort operators form the North Muskoka lake area joined forces to market the north eastern region as a more rugged and less developed resort destination distinct from the busier central and western more commonly known Muskoka region. North Muskoka resorts were located east of Huntsville and stretching over towards Algonquin Park in the Lake of Bays area. Lakes represented by resorts from the original group did include Mary Lake, Peninsula Lake, Lake of Bays and Walker Lake. Over the years other resorts have joined in and the group of select resorts now numbers fourteen properties. As a marketing cooperative the North Muskoka Resort Group changed their name to The Resorts of North Muskoka in 2011. The Resorts of North Muskoka are actively engaged in many forms of marketing the resort collective ... including this web site, social marketing, keyword bidding and news media releases. Recently the group entered a matching funds agreement with Explorers Edge RTO 12 to further brand the North Muskoka area in conjunction with the Regional Tourism Organization. 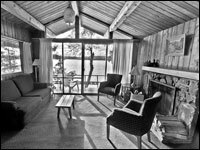 Below is a brief history of the individual resorts and lodge accommodation properties that make up the North Muskoka Group. The Robertson family registered the 160 acre farm and lumber operation as a Crown Grant in 1913. Charles Bishop, Secretary Treasurer of the T Eaton Company and his wife Annie, sister in law of Timothy Eaton bought the property in 1914. At that time the trip was by both train and steamship. By 1933 there was a road to the property. 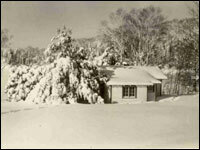 In 1952 Charles sold the property to his son and two years later it was sold to the Hayden family. The Hayden's transformed the property into a small resort using existing buildings. Some of the land surrounding the resort was severed and sold over the years. In 1972 it converted to full housekeeping from it's American Plan roots. In 1986 children Scott and Linda Hayden assumed the management of the resort and continue to upgrade the facility. Bondi started off as a farm in the 1880's and the Tapley family purchased it in 1905 naming it Bondi Farm after the famous Bondi beach in Sydney Australia and began renting tent space by 1910. In the 20's they started offering platform tents and in the 1930's they built their first cottage. The resort staged concerts on the lawn of the resort from the 1910 - 1930's as the owner was a well known actor and musician of fame from Australia. The property is still part farm and up until the late 60's they still harvested hay from the property. Guests would help with the harvest. Now they buy their hay for the horses but guest still help them put it away. They do sell produce directly to guests and the kids can get fresh fresh eggs directly from the free range chicken nests. Grand Duchess Olga Alexandrov of Russia (sister of the Czar) was one notable that stayed at the farmhouse to paint. These paintings are valuable today and rest in various collections. Some guests have been coming for 52 years running. Interesting that all the gravel to build the Bigwin Island Resort came from the Bondi Resort quarry. The Tapley family continues to operate the resort to this day. Cedar Grove Lodge started as a resort in 1927. It has always carried the Cedar Grove name from that time forward. The lodge has been operated by the same family for three generations. It started out as a seasonal resort and became a year round resort destination in 1942. It had one of the first rope tows in Ontario for skiing installed in 1948 and it was powered by an old Jeep. The Algonquin steam ship was a regular attraction for resort guests of Cedar Grove Lodge. Renowned Group of Seven painter A.Y. Jackson was a guest at the lodge from time to time when he came to north Muskoka to paint. 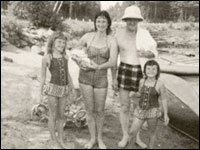 The Jenner family established the cottage resort in 1885. Direct descendant Scott family still runs it today, making it the fourth generation to operate the property on Mary Lake. Before the resort was established it was acquired through an 1869 land grant for the family farm. Farming was difficult in the rugged rocky area and they began to supplement farming with accommodation for hunters and the resort business was born. Trains had reached Huntsville by 1886. 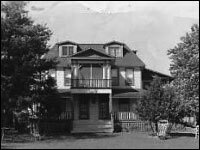 In 1905 a secondary 22 unit annex lodge was added to the original lodge/farmhouse. Steamer service ran to the lodge from the early 1900's to the 1940's. Authors and poets like Robertson Davies and William McDonald were guests of the resort. One family still vacations at the lodge and the descendants has returned every year since 1900 to this day. 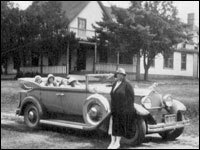 Up to 1946 that family has spent their summers at Clyffe House and since 1946 the family has booked every Thanksgiving weekend including the upcoming 2013 holiday. In the 1940's the resort was known as Brooklyn Lodge. In the early 40's it was renamed Tamarack Cottages and by the early 70's it was renamed Colonial Bay Resort which it has remained since the Howell family acquired it in 1994. The Peninsula Lake location was once a staging ground for logs waiting for Huntsville sawmills to transform logs to lumber. From the resort, Steamships were a common sight for guests. In 1898 the Hungerfords bought the land to farm. By the 1920's it transitioned from farm to resort and it was called Lumina from the beginning. The resort started with platform tents and later developed cottages. Early on guests were brought by steamship to the resort. Local Indians would come to call and bring goods to sell to the tourists like quill baskets. The property has always remained in the same family for more than 100 years. 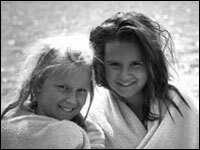 Established in 1890, Port Cunnington Lodge & Resort has been family run since day one. Your hosts the Loader family are descendants of Boyce Henry Cunnington, one of the first hoteliers in the area, and founder of Port Cunnington Lodge. The Victorian lodge remains today as the centerpiece and hub for activities. Over the past several years Port Cunnington Lodge & Resort has been expanded, with the addition of seven custom chalets and additional beach shoreline increased to 1,800 feet. The resort is located on 22 scenic acres in a sheltered bay across from historic Bigwin Island on Lake of Bays. Starting as as sawmill in the 30's the property was owned by the Limberlost company and known as the Weequash Resort meaning White Swan. 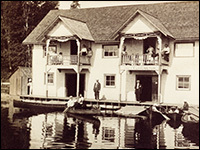 People came by the Algonquin steamship to the Peninsula Lake inn. In 1939 it was renamed Tally Ho Inn and passed through four family generations who currently operate the inn. It was also a popular place for Norwegian pilots in training to go for rest and relaxation during World War 2. 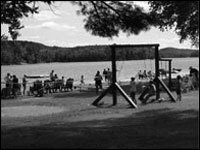 In the 1970's ten cabins were constructed on Oxtongue Lake and the property emerged as a resort. Bathrooms were added in the 1980's and to this day they remain as small upgraded housekeeping cottages. The Oxtongue Lake area was painted extensively by Group of Seven famed AJ Casson in the 60's and 70's.